Brining, for those of you who have never heard this term before, is the process of steeping food in a saltwater solution, thereby locking in moisture and a crazy amount of flavor. You see, meat typically loses about 30% of water when it’s cooked, but when it’s soaked in a brining solution for the better part of the day, it’s able to absorb extra water into the muscle fibers, building up a reserve that is retained during cooking. 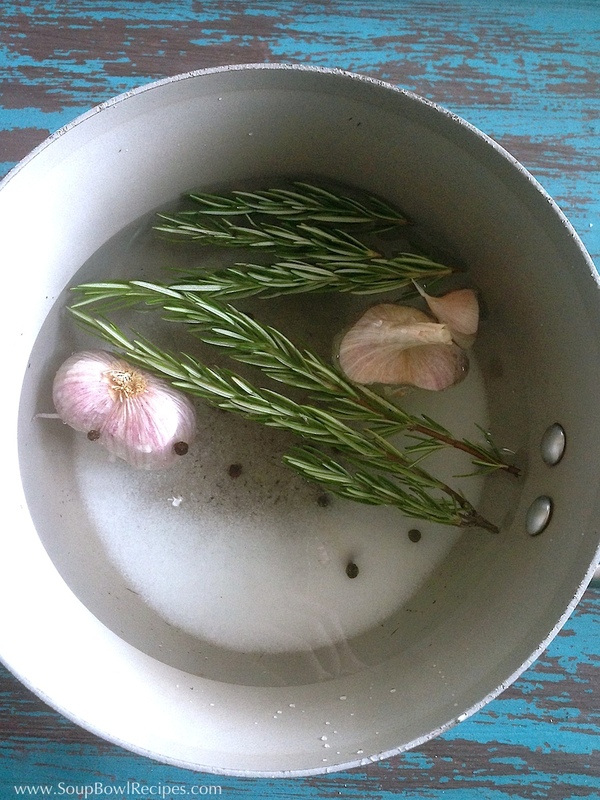 Now, when you add seasonal aromatics (rosemary, garlic, and peppercorns) to the mix, you’re simply ensuring that those flavors will be imparted into the meat as well. Brilliant, right? 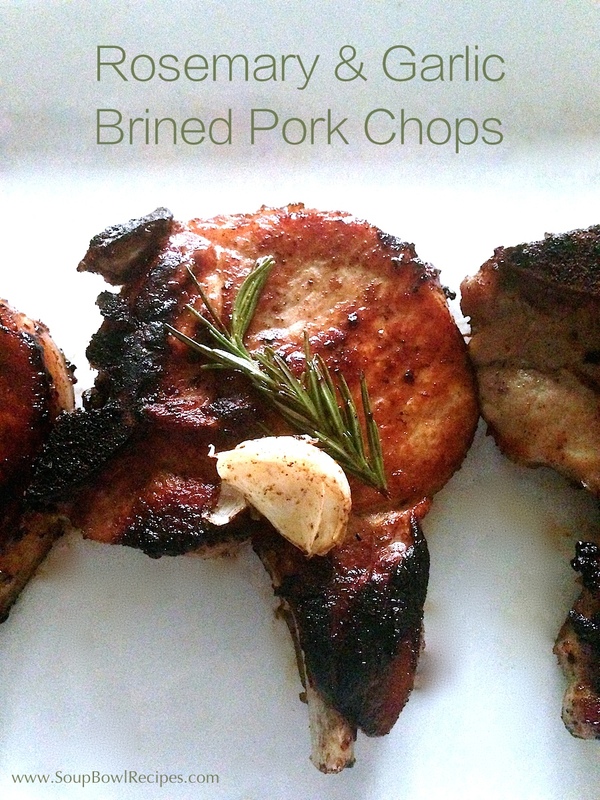 So how do you get such wonderfully juicy and flavorful pork chops, you ask? Simple! Just follow this 4-step cooking process thought up by the brilliant minds over at Bon Appétit. 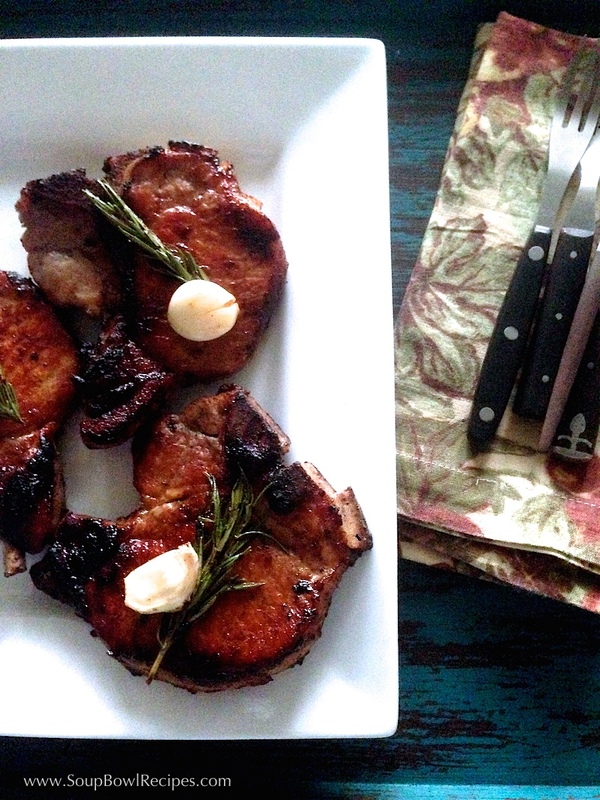 Seriously, these pork chops are no joke, people! Yes, it does take 4-steps (only three of which are actual cooking though) to achieve this juicy goodness, but I guarantee that this will be the most delicious meal you’ve made in forever! 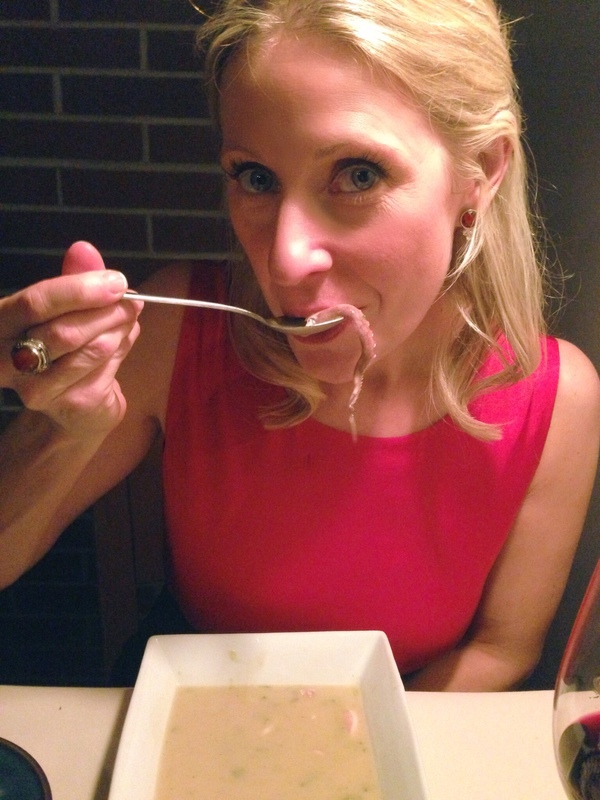 And I promise that if you take the time that this hands-on method requires , I’ll reward you with super easy, super fast recipes for the rest of the week. Deal? Step 1; Brine: Place pork chops in a large, high-sided baking dish. In a medium saucepan, bring water to a boil. Add salt, sugar, 4 sprigs of rosemary, both halves of the head of garlic, and peppercorns and let boil for 5 minutes, stirring to dissolve salt and sugar. Remove pan from heat and add ice cubes to the water. 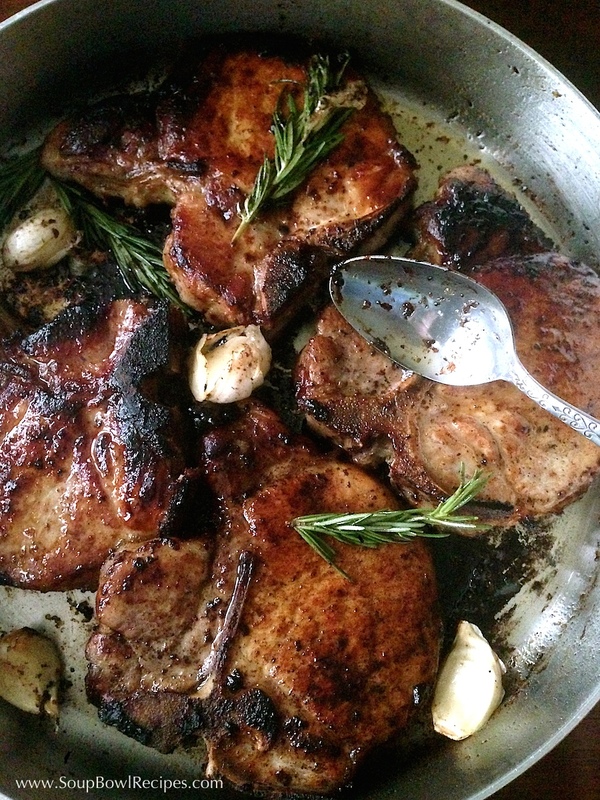 Once the brine has cooled, pour over the pork chops, making sure to include the garlic, rosemary, and peppercorns. Cover and refrigerate for 6-12 hours. Preheat oven to 450°F. Place a wire rack inside a rimmed baking sheet, set aside. 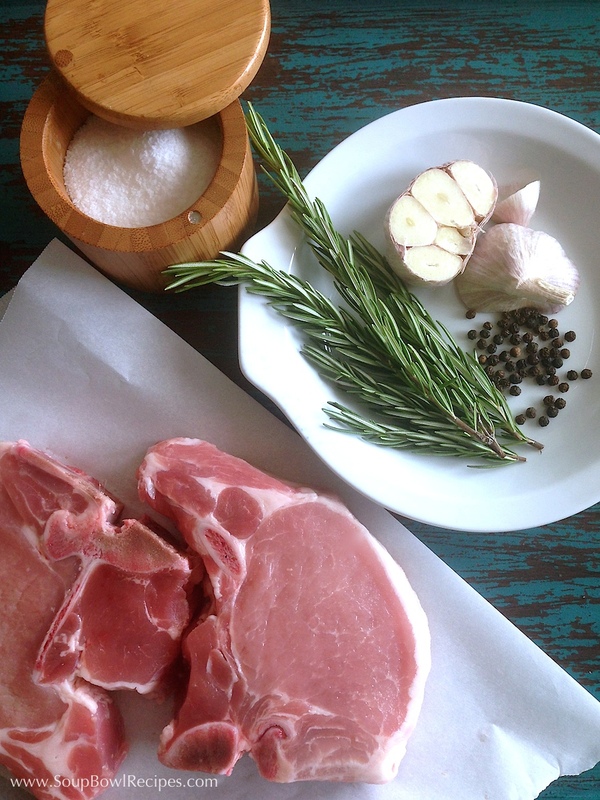 Remove pork chops from brine and pat dry with a paper towel and transfer to a plate. Discard brining liquid, garlic, rosemary, and peppercorns. Step 2; Brown: In a large oven-proof skillet (you may need two skillets), heat oil over medium-high heat. Add chops and cook until beginning to brown, about 4 minutes. Turn (the meat should lift easily; if it sticks to the pan, let it sear for another 1-2 minutes before flipping) and cook until the second side begins to brown, about 2 minutes. Continue to cook, turning every 2 minutes until both sides of the meat are a deep golden brown, about 8-10 minutes total. Step 4; Baste: Carefully drain fat from skill and place over medium heat. Add butter, 4 cloves of garlic, and remaining 4 rosemary sprigs and cook until butter foams. Carefully tip the skillet and spoon butter over the chops. Continue to baste the chops this way until the butter turns brown and smells nutty, about 2-3 minutes. Transfer pork chops to prepared rack and allow to rest for 15 minutes, turning occasionally so that the juices distribute evenly. Reserve butter, cooked garlic, and rosemary in skillet. Transfer pork chops to a large serving platter and drizzle meat with a couple teaspoons of browned butter from the pan. Garnish each chop with a reserved garlic and rosemary. Answer: You’ll find out in my next post!